We are always working to cut back on work and waste. There really is plenty of each on the farm, there is no reason to look for more. 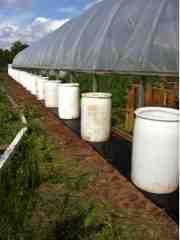 This year the hoop house rain barrels will not have gutters. It's an experiment, so if it does not work next year (or maybe sooner) it will again. 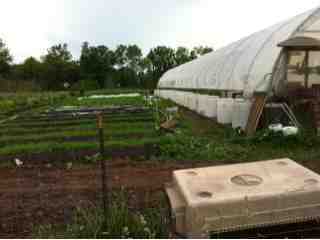 There are ropes on the hoop house, as well as the huge pieces of metal the form the structure. This year the rain barrels are placed where it looks like the rivulets off the roof run. Time will tell. We are just looking to retain water with the least amount of labor.